The President may be willing to provide exemptions from harsh new tariffs on steel and aluminium imports if Brussels allies with him in his battle to combat what he views as unfair trade practices by the Asian superpower. Donald Trump announced hefty duties of 25 percent on steel and 10 percent on aluminium, despite protests by many in his party and some of his top economic advisors. The levies form part of a package of measures which the President insists are for “national security” reasons. But he also says they will revive America’s “dead” metal industries, punish Chinese overproduction and reduce the US’s massive trade deficit with Beijing. Exemptions for the duties have already been drafted for neighbouring Mexico and Canada, and it was announced this week Australia has also avoided being hit by pledging its support for a new “security agreement”. Though it is not yet clear whether the sizeable levies will apply to the European Union and spark a trade war. 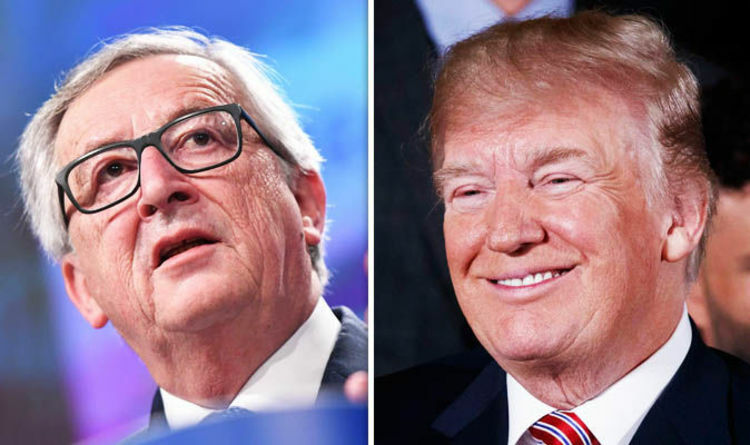 But according to sources inside talks between US and European trade officials, the EU could avoid the tariffs if it demonstrates its willingness to support Mr Trump in his fight against China. US Trade Representative Robert Lighthizer met with European Trade Commissioner Cecilia Malmström over the weekend to establish whether the bloc would be hit by the measures. Three people briefed on the outcome of meetings told Politico the European Commission has now informed member states an exemption could be on the cards providing an alliance against China and other criteria are met. Exports to the United States make up a major part of the UK steel industry’s business, and 25 percent tariffs would potentially devastate the already fragile sector at a time when it is beginning to show signs of recovery. Approximately seven percent of the UK’s steel output, or 350,000 tonnes, was exported to the US in 2017. Brussels initially promised to retaliate by imposing similar measures. Expressing his reluctance to wage a trade war with one of the EU’s closest allies, European Commission President Jean-Claude Juncker said the bloc would have no choice but to fight back. Speaking on German television shortly after Mr Trump’s trade war tweet was posted, he said: “If the Americans impose tariffs on steel and aluminium, then we must treat American products the same way. “We must show that we can also take measures. This cannot be a unilateral transatlantic action by the Americans.